Chamber Music at the Clark concert seating is determined via lottery. The booking-by-lottery entry form for Neave Trio concert seats posts here on Tuesday, January 5, 2016. Lottery registration closes Tuesday, January 26, 2016. Hailed by critics for its “bright and radiant music making” (Robert Sherman, WQXR Radio) and praised for its “heart on-sleeve performances” (Classical New Jersey), the Neave Trio has been described as “a revelation” (San Diego Story) and “a brilliant trio” (MusicWeb International), who has “exceeded the gold standard and moved on to platinum” (Fanfare Magazine). 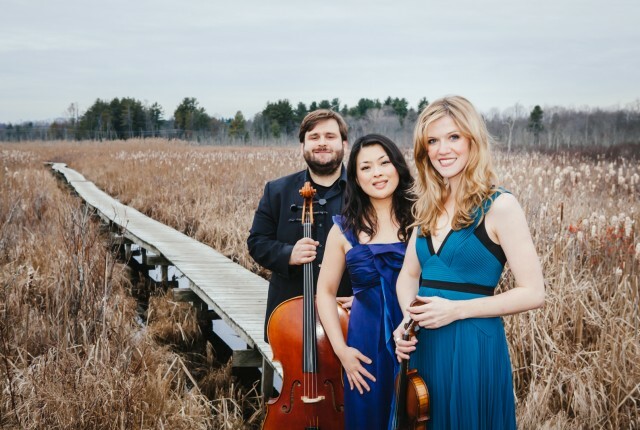 The Boston Musical Intelligencer ranked the Neave Trio among the finest chamber ensembles of their generation, writing: “it is inconceivable that they will not soon be among the busiest chamber ensembles going” (“Brightness and Radiance at Rockport,” Steven Ledbetter). Trio members hail from the United States, Japan, and Russia. Graduates of the Yale, Manhattan, Mannes, and Longy Schools of Music, the Cleveland Institute of Music, and the Chopin Academy in Moscow, the ensemble has enjoyed international success at recital and festival performances in the United States, Canada, South America, and Europe, performing in some of the world’s finest concert halls. Currently in residence at San Diego State University, as well as the LyricaFest and ArtsAhimsa music festivals, the Trio goes to great lengths to collaborate with artists of all mediums. Most recently, collaborations have included projects with the Blythe Barton Dance Company, projection artist Ryan Brady, and composer Amanuel Zarzowski, with whom the Trio launched an interactive concert series “Stein2.0.” The series seeks to expand the concert-going experience to a wider audience, using audience participation and social media tools. Members of the Neave Trio have been recipients of the Lilian Fuchs Chamber Music Prize, the Gartoff Foundation Prize, and the Yale School of Music Chamber Music Prize. The Trio has worked with distinguished artists including Menahem Pressler, Leon Fleischer, Claude Frank, Anne Marie McDermott, Yehudi Wyner, Laura Bossert, Terry King Pinchas Zukerman, Joseph Kalichstein, Gilbert Kalish, Donald Weilerstein, Vivian Weilerstein, Robert Mann, and Peter Serkin.